FREEHOLD, NJ – Monmouth County Surrogate Rosemarie D. Peters has been appointed to the Judiciary-Surrogates Liaison Committee by the New Jersey Supreme Court. The liaison committee is comprised of five Superior Court judges and five county Surrogates from across the state. Created in 1983, the group’s role is to address issues of mutual concern and to improve practices and procedures in the areas of estate, guardianship and adoption matters. As judge of the Surrogate Court of Monmouth County, Peters has the authority to qualify executors and trustees named in wills, to appoint administrators for those who die without wills, and to appoint guardians for minors and legally incapacitated persons. Peters also serves as deputy clerk of the Superior Court for contested estate matters, declarations of incapacitation, and adoptions. The Surrogate’s Office is a department of county government and the custodian of the records of estates, wills, guardianships and adoptions dating back to the late 1700s. These records provide an important source of information for title searchers, genealogists, and local historians. The Surrogate places adoption records under seal and maintains these records. Peters is a graduate of Rutgers School of Law-Newark, Thomas A. Edison State College, and Brookdale Community College. She is a member of the New Jersey and Monmouth County Bar Associations. 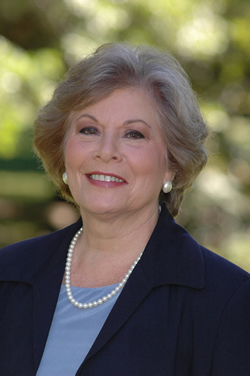 Prior to her election as Surrogate in 2006, Peters served on the Middletown Township Committee for 18 years, four of them as Mayor and three as Deputy Mayor. She is also a former member of the Middletown Planning Board and Zoning Board of Adjustment. She is a past member of the Executive Board and Legislative Review Committee of the NJ State League of Municipalities. The Surrogate is a constitutional officer who is elected to the position by county voters every five years. Peters is in the fourth year of her first term as the Monmouth County Surrogate.